Compact double room with en-suite shower room. Sky TV and window to side of property. Newly renovated double bedroom with en-suite shower room. Sky TV and window to side of property. Sea view bedroom with large bay window to front of property. En-suite shower room. Sky TV. Excellent sea view bedroom at front of property. Spacious shower room. Sky TV. Spacious room with additional sitting area. Cricket field views to rear of property. En-suite shower room. Sky TV. Sea view bedroom with additional sitting room upstairs. Shower room and bathroom. Sky TV. Amazing sea views from bedroom with large window to front of property. En-suite shower room. Sky TV. 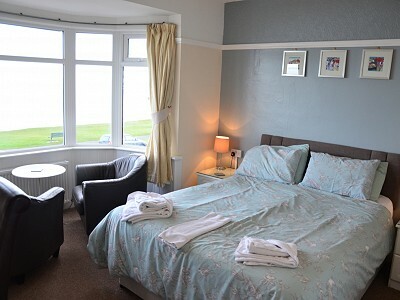 Excellent room at front of property with spacious en-suite shower room and wonderful sea views. Sky TV. Spacious double room to rear of property with private balcony overlooking the Cricket Field. Sky TV. Spacious room towards rear of property but still enjoying a sea view. En-suite bathroom. Sky TV. Large room to rear of property with Cricket Field views. Spacious en-suite. Sky TV. Spacious ground floor room with jacuzzi bath. Sky TV. Additional single room available if required. Ground floor room with easy access from reception. En-suite shower room. Sky TV. Guest lounge available with TV, sea view, self-service bar and comfortable seating. We have implemented a cookie control system to enable visitors to opt-out of being tracked by Google Analytics. You can access this by clicking on the little icon in the bottom left hand corner of the screen and following the instructions provided. For more information about our privacy practices, if you have any questions, please contact us by email at enquiries@wheeldale-hotel.co.uk, by telephone: 01947 602365 or by mail at The Wheeldale<="" span="">, 11, North Promenade, Whitby, North Yorkshire, YO21 3JX.